Basic request form with no options. Advanced request form using custom fields and options. What about privacy and GDPR? This plugin does not store any data submitted via the form. Your site connects directly to the Zendesk API to transmit the ticket data immediately. For information about privacy and GDPR, please see Zendesk’s policy on this page. How do I get my Zendesk API key? You can generate an API key from your Zendesk dashboard using this guide. How are messages sent to Zendesk? This plugin will connect directly to your Zendesk account via the Zendesk API. This means you do not need to worry about missed emails being sent. The data is transferred directly via the WordPress HTTP API. Can I translate the form into my language? This plugin is fully translatable into any language. If you find that there is some text that has not already been translated, you can add your language on this page. How do I change the order of the form fields? You can set the position of each field using the Order value whilst editing the custom field. Lower numbers appear first in the form. You can also use a plugin such as this to re-order the fields. This is much easier since it allows you to drag and drop them into the correct order. Yep! This plugin was created for our own suppport site, so we will continue to add new features. If you have a suggestion, you are welcome to post it in the support forum. Update information for Zendesk Inc trademarks. Increase timeout limit for file uploads to 10 seconds. Check for WP_Error on file upload request. Include WP_Error message in email when WP_Error occurs. Enhancement: Better validation of URL inputs. Force the user to add “http://” to the front if not already. Fix: Prevent duplicate form submissions from double clicks. New: Set the Description field as optional by adding description=”optional” to the shortcode (example). New: Option to split the “Your Name” field into two separate fields: “First name” and “Last name” (example). New: Option to move Custom Fields below the main “Description” field (example). New: Option to CC an email address when ticket is sent. New: Option to redirect user on fail. Enhancement: Auto-capitalize first letter of name. Sanitize ‘Custom Field ID’ using sanitize_text_field rather than absint. Fix issue with redirecting form in WP 4.9. Option to open page in new window when submitting form. Add new_window="yes" to your shortcode to do so. Option to force user to attach a file using attachments_required="yes"
Make attachment field text translatable. Allow file attachments on forms. 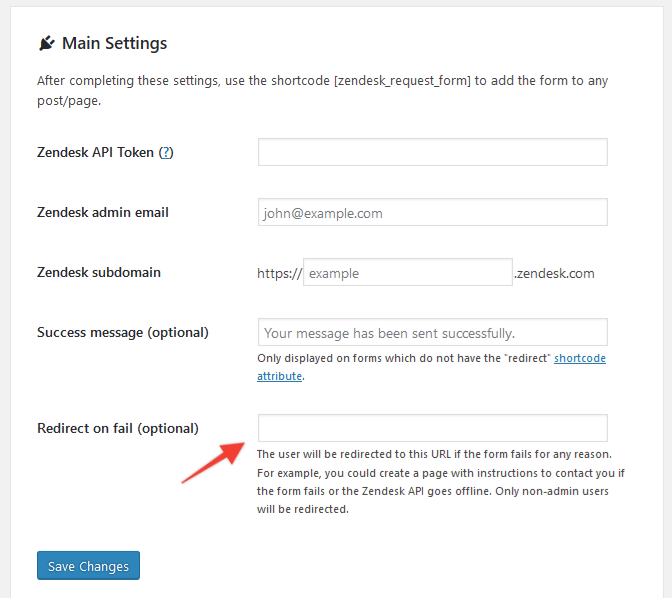 Check the shortcode generator options at ‘Settings > Zendesk Form’. Option to override “Your Name” and “Your Email” labels. See this post for instructions. Option to set ticket Priority via shortcode. Forms will now work correctly even if wp-admin is blocked for the current user role. Ignore blank lines from “Dropdown” field items – Props @jaworskimatt. Ability to set the default “Dropdown” option. Read more. Add CSS class to “Extra Info” span. Remove paranthesis from “Extra Info” text. Allow user to re-add if required. Remove <br /> tags from field labels. New “Date” custom field type. New “textarea” custom field type. More stable redirection on form submimssion. Option to override default field labels (more info). Shortcode generator on settings page. Set input fields to 100% width for better styling. Enhancement: If theme does not include form styling, make form 100% width of container. Enhancement: Option to remove User-Agent string from showing at the bottom of ticket description. Set shortcode parameter useragent="no" to disable. Minor refactoring to improve code readability. Enhancement: More efficient form action/loading time. Fix: Issue with Contact Form 7 plugin. New: Dropdown custom field support. New: HTML5 pattern option for custom feilds. Enhancement: Prevent “double click” duplicate form submissions. Enhancement: Disable spam check if requester is logged in. Enhancement: Add CloudFlare Geolocation to User-Agent data. Enhancement: Update to match new Zendesk branding. New: Option to Pre-fill Name and Email via shortcode. New: Option to disable prefilling of field information from logged in user account. New: Checkbox custom field support. Enhancement: Set unique ID on field <p> tags for easier styling. New: Google Analytics Events tracking on form submit button. Group specified fields into different instances of form/shortcode. Extra form customization options via shortcode attributes. Pre-fill form fields with user data for useres who are logged in to WordPress. Custom url to redirect user to once the form is submitted. Pre-fill custom fields via GET from url query. Add browser User-Agent string to ticket data. Use WP http API instead of cURL.